PHOENIX – Muslims in America have been burdened with a label of terrorism that colors others’ perceptions of Islam, a religion of peace and diverse followers, Arizona Muslims say. “You can’t put Islam in a box,” said Johnny Martin, 23, a Mesa resident who converted to the faith two years ago. Muslims in Arizona and across the nation are much like everyone else, say adherents. Brothers and sisters. The people who are in line at the grocery store and by the voting booth. Political conservatives and liberals, gay and straight, lifelong adherents to their religion and recent converts. Arizona has seen its share of controversy over terrorism that has marked the world. In May 2015, Phoenix residents Elton Simpson and Nadir Soofi traveled to Garland, Texas, with the intention of attacking an art exhibit featuring images of the Prophet Muhammad. They were killed by a SWAT team before carrying out their plan. Another man from Tucson is on trial, accused of attempting to plan a terrorist attack. 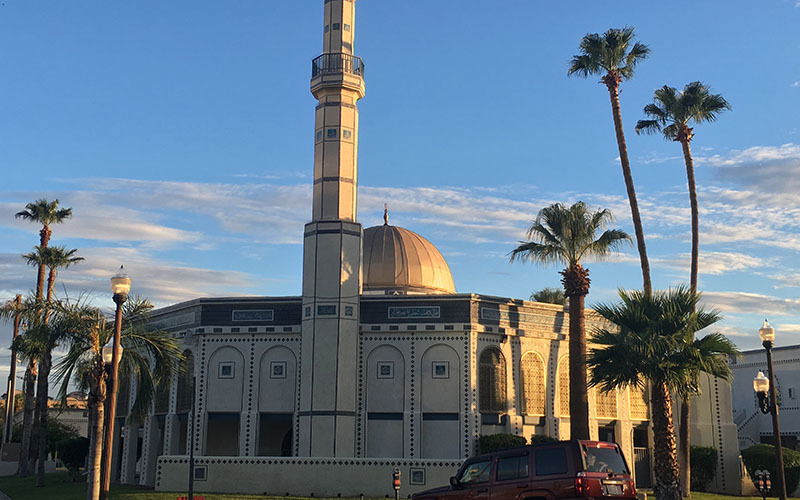 Several Arizona Muslims pointed out that acts of violence carried out by the terrorist group ISIS do not reflect the peaceful teachings in the Quran. Misunderstandings grow out of such terrorist acts, Arizona Muslims lament. “Many Americans are afraid of the unknown, they don’t know what Islam is,” said Hani Rahal, a leader in the Shia Muslim Al-Mahdi Benevolent Foundation, a Tempe-based Islamic religious and educational center. Martin said someone can’t simply fill in a blank with their own idea of who Muslims are and what they believe. “No one decides what Islam is and who the real Muslims are other than Allah,” Martin said. Martin, who is bisexual, became public about his sexual identity after the Orlando, Florida, nightclub shooting, where 49 people, many who were gay and Latino, were shot to death. An estimated 50,000 to 60,000 Muslims live in Arizona – exact numbers are hard to come by – with each person shaped by similar and different experiences. 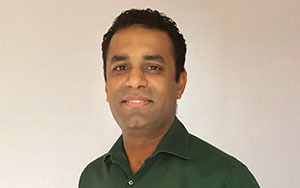 Imran Siddiqi is the head of the Arizona branch of the Council on American Islamic Relations, more popularly known as CAIR, a Muslim advocacy group with regional offices nationwide. Siddiqi says that Arizona is a “melting pot,” where Muslims are largely welcomed. However, he said that in his work with CAIR, he has received reports of discrimination from Arizonans two or three times a week. Most cases don’t even go reported. Siddiqi described the May 2015 anti-Islam protest outside the Islamic Community Center of Phoenix as a “turning point” in Islamophobia in Arizona. The protest, in response to the attack in Garland, Texas, drew more than 200 protesters, many of whom wore shirts and brandished signs berating Islam and Muslims. Siddiqi was particularly alarmed about the number of protesters who were armed. He said the intersection of Islamophobia and gun culture is an issue facing Arizona, even though he said there hasn’t been a “huge swath” of hate crimes in the state. Siddiqi said one of the biggest misconceptions about Islam, both in Arizona and nationwide, is that Islam is something “foreign” and new to America. He said about 20 percent of African slaves brought to America were Muslim. “Muslims have been here as a part of America since day one,” Siddiqi said. The Pew Research Center estimates one percent of Arizona residents are Muslim. However, there is little to no data on other information, such as growth potential or other demographics about Muslims in Arizona. Muslims, similar to other religious groups, have diverse political views but largely vote a Democratic ticket. About 70 percent of Muslim Americans identify or lean toward the Democratic Party, while 11 percent favor the Republican Party, according to a 2011 Pew poll. “He doesn’t have a secret agenda. He truly wants the best for everyone,” said Said, 19, a Phoenix resident. But Zuhdi Jasser is a controversial, card-carrying conservative activist. The Scottsdale resident supports “family values,” the Second Amendment, a strong national defense and small government. 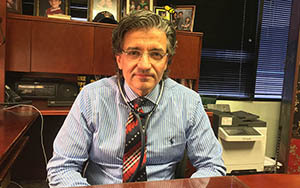 Jasser admits this has often put him in conflict with other Muslims in the Phoenix area, especially those who criticize American military policy abroad. He points to being uncomfortable when an imam criticized the American military presence in Iraq in the early 2000s. “He’s free to have those foreign policy positions, I just don’t think it’s appropriate to do that at the mosque,” Jasser said. Several Muslims said there are some glimmers of hope in how non-Muslims perceive Arizona adherents to Islam. Umer Shahid, 32, of Tucson, hopes that by spreading the message of his Ahmadiyya faith, he can show the world that Islam is far separated from the brutality of ISIS and other terrorist groups. Martin wants to bring together people of different faiths, including Muslims, Jews, Christians, as well as atheists, to better understand each others’ religious faiths. He ultimately seeks a more understanding world. Siddiqi believes that the main way to fight against discrimination against Muslims is to educate others about Islam. Who he is: Rahal, a Lebanese-American who was born a Muslim, is a member of the Shia sect, making him a minority among the largely Sunni Muslims in Arizona. Rahal left Lebanon, where he was born, shortly before it descended into civil war in the 1970s. 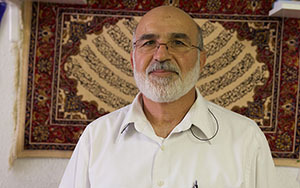 He attended Arizona State University in the 1980s, where he met his wife, who later converted to Shia Islam. Since the late 1990s he has been a leader in the Al-Mahdi Foundation, a Shia Muslim group. Its headquarters in Tempe is a place of prayer and education. Rahal speaks softly and calmly as he talks about the way he practices Islam. To Rahal, the Islam that the Prophet Muhammad brought was that of love, peace, passion and respect for other human beings, Muslim or not. What Shia Islam means to him. Who he is: A member of the Sunni sect, Jasser is one of the most prominent Muslim members of the Republican Party. He occasionally appears as a conservative analyst on Fox News, and often spars with other Muslims in the Valley over his criticism of what he perceives as “Islamist” influence, with religion too intertwined with government policies. A spokesman for the Council on American Islamic Relations went as far as to call him a “sock puppet” for haters of Islam, saying he was an “enabler” of Islamophobia. Jasser, otherwise calm and serious, got angry when asked about his critics. He called those who call him an Islamophobe “corrupt and dishonest,” and believes it is an attempt to silence his group’s ideology. Zuhdi Jasser explains a favorite Quranic verse of his. Who he is: Shahid is a member of the Ahmadiyya sect, neither Sunni nor Shia. Ahmadiyya Muslims number about 20 million in the world and have a small presence in Arizona. Ahmadiyya is an Islamic religious movement that began near the end of the 19th century in British India. Ahmadiyya Muslims follow conventional Islamic doctrine but diverge in their belief in the life and teachings of Mirza Ghulam Ahmad, who they see as the promised Messiah as well as the second coming of Jesus Christ. Shahid believes in the Ahmadiyya goal of spreading what “true Islam” is to the masses now more than ever. He tries the best to do this through communal work in Tucson, including going to local book conventions to introduce Ahmadiyya to non-Muslims. Umer Shahid explains support, opposition and duty. 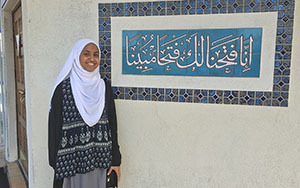 Who she is: Sumayyah Dawud is a local activist who converted to Islam three years ago, and said that she “leans Sunni.” Dawud sees her activism and her faith as inseparable, believing that within Islam there is a strong belief in social justice. She shows this with her activism, which has included protesting against Islamophobia, favoring transgender and LGBT rights, supporting Palestinian rights and fighting police brutality and on behalf of refugees. Dawud shows emotions through her glasses-adorned eyes, as she wears the full niqab over her face, one indication of her religious conservatism. 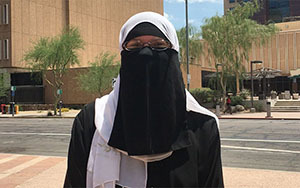 In 2015 Dawud, who is transgender, made local and national headlines from her dispute with the Islamic Community Center of Tempe, whose leaders asked for medical records from Dawud proving that she was biologically female. She said because of the reactions she often gets when attending mosques, which include complaints and harassment, she tends to do most of her prayer at home. Sumayyah Dawud explains why she wears the niqab. Who she is: Said, an Arizona State University student who was born and raised Sunni, is of Somali descent. Her parents fled Somalia in the 1990s for the United States. Born in California, Said has lived in Seattle, Washington and Egypt. Said is the newly appointed president of the Muslim Student Association of ASU. She frowned as she talked about what she believes is a recent escalation of Islamophobia in the United States. She said Republican presidential candidate Donald Trump is at least partially responsible. “I just want to sit with him and tell him it’s going to be all right, and Muslims aren’t that bad,” Said said. Mona Said talks about some of the negative reactions she gets. Who he is: Martin, an Arizona State University student who converted to Islam about two years ago, is a self-described interfaith activist. He can often be seen holding up a large sign for his interfaith group Sun Devils Are Better Together, which has sought to bring together people of different faiths and “engage across lines of difference” since it was founded two years ago. 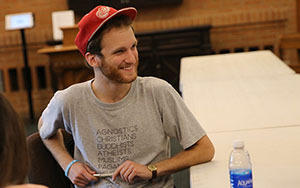 Often sporting a baby blue baseball cap with “Allah” inscribed in Arabic, Martin has a calm and positive demeanor as he speaks about his interfaith work. Martin said that coming out as bisexual in the wake of the Orlando attacks has led to more media attention, including an appearance on Arizona Horizon. Johnny Martin talks about his intersectional identity. 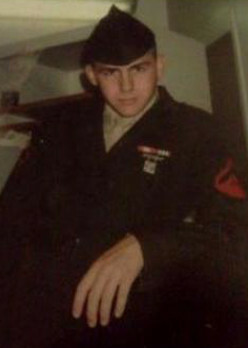 Who he is: Harvey Martin didn’t know a whole lot about Islam until he went on a date in Yuma, where he was stationed with the Marine Corps. 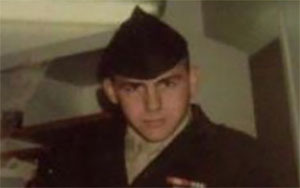 Martin and his now-wife Kaoutar Burrell, a Moroccan-American Arizona native, went to a restaurant, and she requested that he not eat pork products in front of her because pork is haram (prohibited) in Islam. They later went to a local mosque, and he learned more and more about Islam before he converted to the religion about fourteen years ago. Martin’s Southern accent, from roots in Baton Rouge, Louisiana, is audible as he talks about what Islam means to him. He is also currently running for Congress in Arizona’s 3rd district, which he describes as a “grassroots” campaign being done on Twitter and Facebook. Martin remained in Yuma after his deployment, and described the Yuma Muslim community as small, “about 100 families,” but very tightly knit and always willing to help one another out. Correction: A previous version of this story misstated the congressional district where Harvey Martin is a candidate. Martin is running in Arizona’s 3rd District.